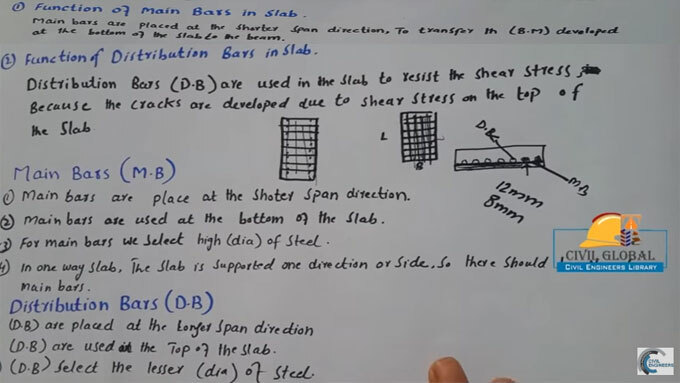 Sami Ullah, the renowned engineer, presents an useful construction video tutorial where he briefly explains what is main and distribution bars in the slab as well as variations among them with regards to bending moment and shear stress. As per reinforcement details, there exist two sizes of bars namely main bar & distribution bar in the slab. FUNCTION OF MAIN BARS: Main bars are placed at the shorter span direction to transfer the bending moment (B.M) developed at the bottom of the slab to the beam. Main bars (M.B) are arranged at the shorter extent in the slab to encounter high bending Moment called as sagging or positive bending moment. The purpose of main bars is to combat all the tensile stresses, bending moment (Sagging), and superimposed load (Dead load) which occur at the shorter extent of the slabs. Main bars (M.B) are employed at the rear end of the slab. The high dimension of steel in the slab is chosen for main bars. In one way slab, the support for slab is given at one direction or one side, so it becomes possible to set the main bar at the shorter extent. Main reinforcement bars are arranged in one way slab in one side (At shorter extent), but in two way slab, the bars arranged in both ways. In Flat plate slabs, the main bars are arranged in one direction at bottom of the distribution bar (in shorter extent). Main bars in the slabs must not be under 8 mm when (H.Y.S.D) is applied or 10 mm when the Plain bars are applied. FUNCTION OF DISTRIBUTION BARS: Distribution bars (D.B) in the slab, plays an important role as it can withstand the shear stress. As the cracks are formed to shear stress on the top of the slab, so, the distribution bars should have been arranged at the longer span of the slab. Distribution bars (D.B) are arranged at the direction of longer extent in the slab. Distribution bars (D.B) are applied at the Top of the main bars perpendicularly. For Distribution bars (D.B), it is required to choose the smaller dimensions of steel, as it’s objective is to defy the shear stress in the slab. The purpose of distribution bar is to allocate the super imposed load uniformly or resist the Shrinkage stresses formed because of Temperature variation (Winter,Summer). In Flat plate slab the, distribution bars are arranged in one direction at Top of main bar (in longer span). The distribution bars should not be under 8 mm in a diameter or not be over 1/8 of the thickness of the R.C.C slabs. The distribution bars are arranged to retain the mesh in perfect place and sustain the center to center c/c, bars spacing among main bars.